Sadly we see many cases of “blocked cats”. 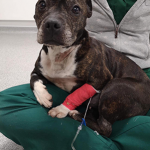 This is a very serious condition and can get very bad very quickly, even in a seemingly healthy animal. The most at-risk individuals are middle aged, overweight, neutered male cats, although any male or female cat or dog can be affected. Urine is produced in the kidneys and stored in the bladder until the cat empties it’s bladder. Crystals in the urine can build up and form stones in the bladder. When the cat tries to urinate, the stones can move from the bladder into the urethra (the tube that empties the bladder). 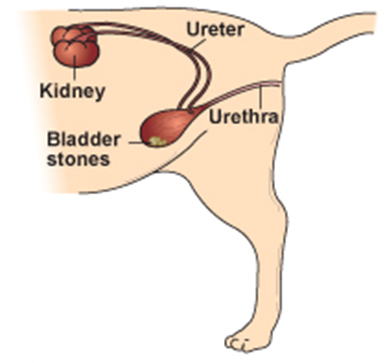 The urethra is very small and the stones can easily get stuck here, blocking the passage of urine out of the body. If urine cannot be emptied due to a blockage, it stays in the bladder and the bladder gets bigger and bigger, until it is at risk of bursting, much like a balloon that has been over-inflated. Furthermore, urine contains lots of toxins and waste products that need to be emptied from the body, so if the bladder isn’t emptied, these toxins build up in the body, which can be life threatening. Signs of a blockage include blood in the urine and straining to urinate. 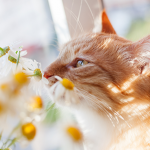 Your cat may vocalise while trying to pass urine and may seem very pained and uncomfortable. If your cat has stopped urinating altogether, this is an emergency and he will need to be seen by a vet straight away! Don’t hesitate to take him to The Vet – the sooner we see them and unblock their bladder, the better their chances of recovery!